We’re cooking up 4 delicious healthy chicken salad recipes, which are all made from a yogurt base and are excellent for meal prep. 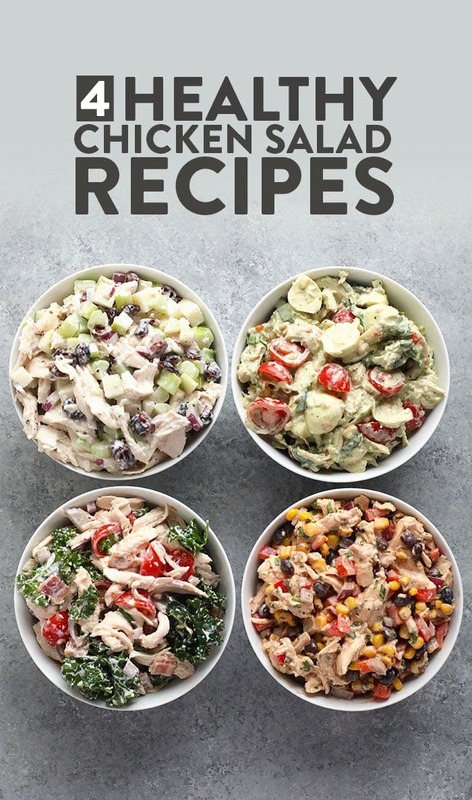 From southwest chicken salad to cranberry chicken salad, you are going to love all 4 of these delicious recipes! Hello my Fit Foodie crew! Grab a piece of paper and a pen because you’re going to want to write down these healthy chicken salad recipes! We know you love a good chicken salad because some of our most popular recipes are just that. 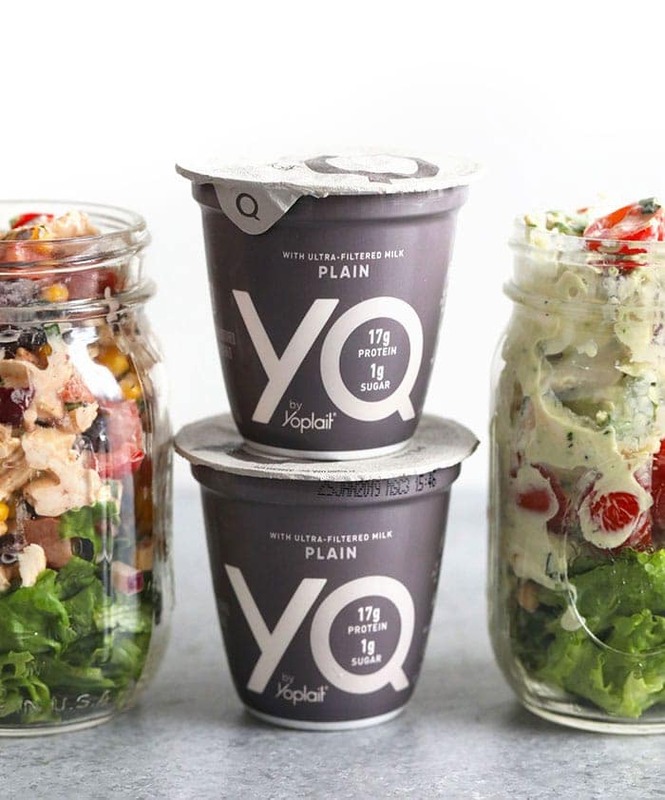 Today we’re bringing you 4 brand new chicken salad recipes all in one post and in collaboration with a new brand partner, YQ by Yoplait! Today we’re partnering with our friends at YQ by Yoplait. 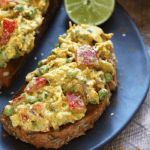 The base of these chicken salad recipes is made with YQ by Yoplait’s deliciously creamy Plain high protein yogurt that’s made with ultra-filtered milk. 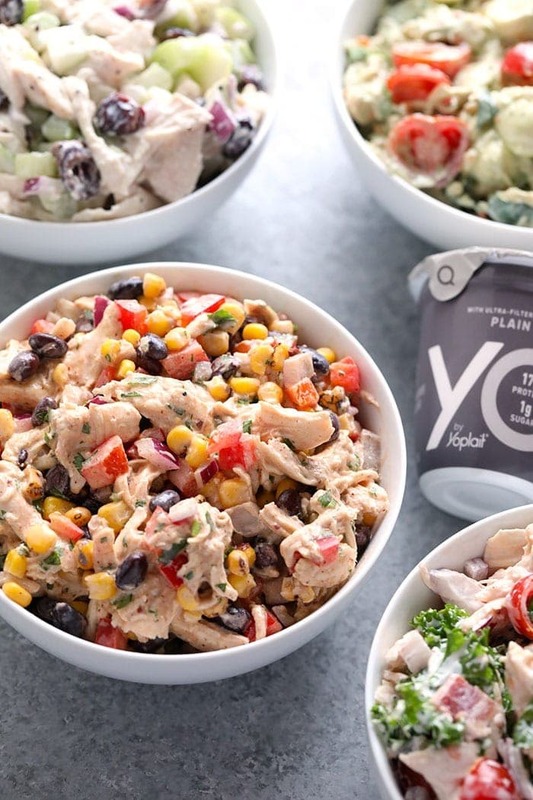 We love this healthier swap for mayo and other classic chicken salad sauces because Plain YQ by Yoplait contains a whopping 17g of protein and 1g of sugar (amazeballs) per serving. When you look at the back of the Plain variety it’s literally 2 ingredients: pasteurized grade A ultra-filtered milk and yogurt cultures. 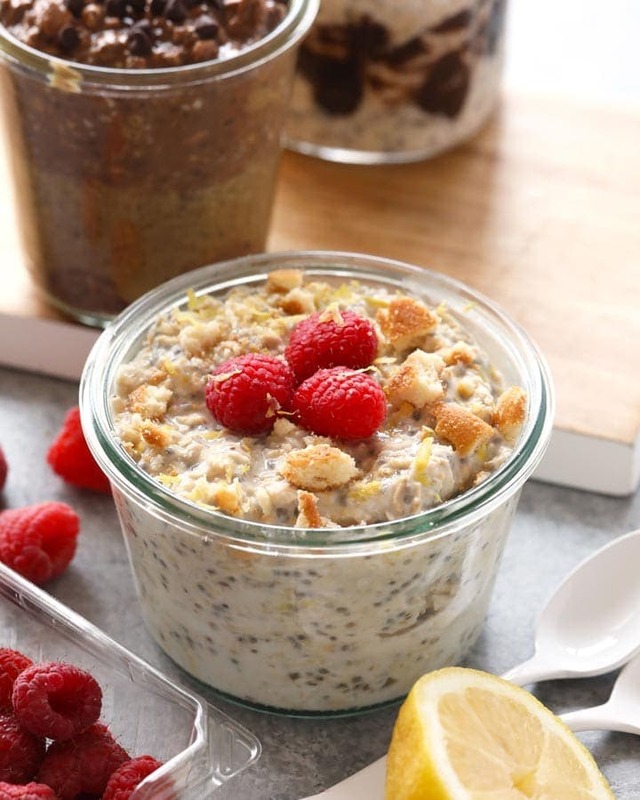 great for on the go, meal prep, or baking! YQ is available nationwide and you can use their store locator HERE to find some near you! Oh, good ol’ shredded chicken! In these recipes, we used shredded chicken as our base because it’s super easy to make. We’ve got two simple tutorials on Fit Foodie Finds where we show you how to shred chicken in no time. The first one is done in the Instant Pot and the second one is done in the slow cooker. You can totally make shredded chicken in the oven and on the stove-top as well, we just find these two methods as the easiest! Clearly, we are all about the add-ins here at Fit Foodie Finds. Things like veggies, spices, dried fruit, and cheese give your chicken salad spice and personality. In this post, you’ll find four different festive healthy chicken salad recipes all with easy, nutrition add-ins! And now, for the most important part of your healthy chicken salad recipe…the sauce! In these chicken salad recipes, the star is definitely the yogurt. YQ by Yoplait’s Plain flavor is the most perfect base for these recipes because it’s smooth, creamy, and has a bit of a tang. Each of these variations calls for 1/2 cup of YQ by Yoplait, which is roughly the same size as their single serve containers. To flavor your yogurt sauce, we used things such as spices, citrus, salt, pepper, and hot sauce! 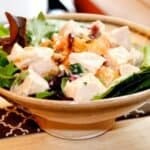 Keep reading to find 4 amazing healthy chicken salad recipes that are oh-so flavorful and super easy to make! Love southwestern flavors? 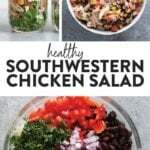 Try our healthier southwest chicken salad! It’s made with a citrus-infused southwestern yogurt sauce and a little bit of hot sauce to top things off! In addition to shredded chicken, here’s what you need for this amazing chicken salad! Our Cranberry Chicken Salad with Apples is a classic recipe made with a healthy twist! 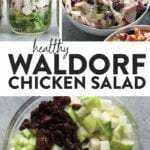 It’s very similar to Waldorf Chicken Salad, but made with a delicious yogurt sauce, a little bit of honey, and lemon juice! Please tell me you’re a BLT lover! 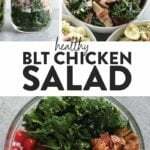 This BLT Chicken Salad is so yummy and healthy too! The chicken salad sauce is so yummy and made with yogurt, a little bit of ranch seasoning (secret ingredient) and lemon juice! 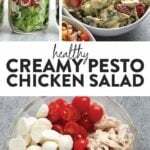 Healthy creamy pesto chicken salad?! Uh, yes, please! Our pesto chicken salad is made with classic Caprese ingredients and a yogurt-based pesto sauce that you’re going to love! 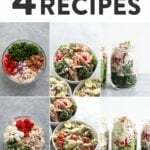 Mason Jars: add your favorite greens to the bottom of a mason jar and top it with a serving of one of these chicken salad recipes! Screw the top on an BOOM, you’re ready to go. 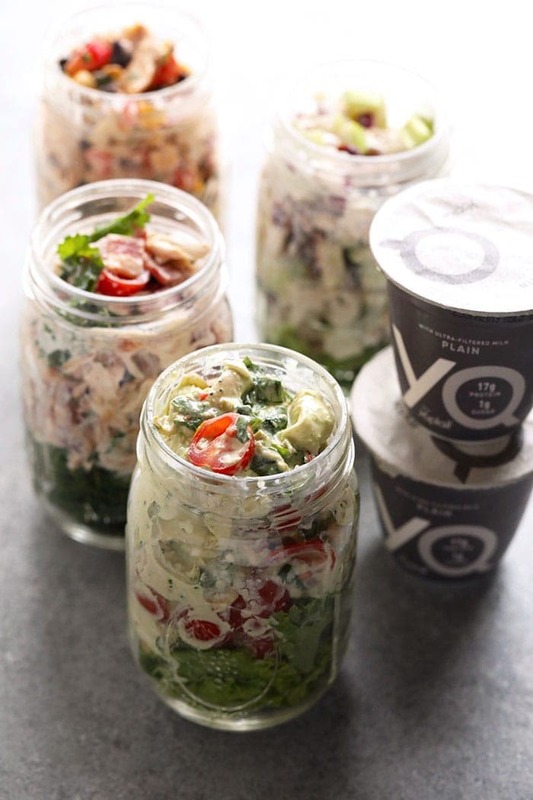 Bento Boxes: Glass bento boxes are the latest craze and a genius way to pack these chicken salads for on the go. Add a serving of chicken salad along with more veggies, fruit, and your favorite crunchy for a balanced meal prep lunch. Wraps: Are you chicken salad wrap fan? Good news is, all 4 of these recipes are delicious wrapped inside of your favorite tortilla! Add some greens and any other add-ins your heart desires, a serving of chicken salad, and you’ve got yourself an epic wrap ready to eat! Pro tip: we find that classic white tortillas wrap the best and would avoid using corn tortillas. 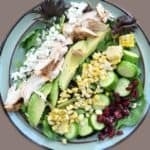 If you LOVE healthy chicken salad so much that you’re looking for more recipe inspiration, check out some other Fit Foodie Finds chicken salad recipes below! We’re cooking up 4 delicious healthy chicken salad recipes, which are all made from a Greek yogurt base and are excellent for meal prep. 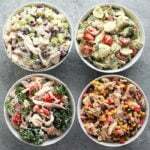 From southwest chicken salad to cranberry chicken salad, you are going to love all 4 of these! Place shredded chicken, sweet corn, black beans, red onion, fresh cilantro, and red pepper into a large bowl. Mix and set aside. Create the sauce by mixing together YQ by Yoplait, lime juice, cumin, chili powder, salt, and hot sauce. Create the sauce by mixing together YQ by Yoplait, lemon juice, honey, garlic powder, salt, and pepper. First, make your massaged kale. Place kale into a medium bowl and drizzle on a teaspoon of olive oil. Then, use your hands to massage the oil into the kale for 3-5 minutes or until the kale becomes wilted and broken down. Place shredded chicken, bacon, cherry tomatoes, red onion, and massaged kale into a large bowl. Mix and set aside. Create the sauce by mixing together YQ by Yoplait, ranch seasoning, lemon juice, and hot sauce. 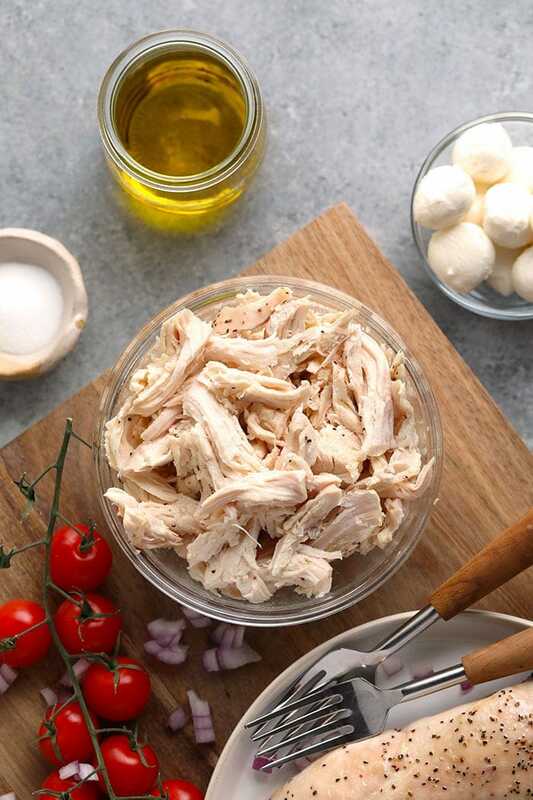 Place shredded chicken, cherry tomatoes, mozzarella balls, pine nuts, and fresh basil into a large bowl. Mix and set aside. Create the sauce by mixing together YQ by Yoplait, pesto, lemon juice, salt, and pepper. 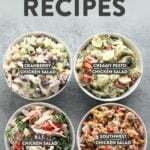 Serving Size: Each of these recipes serves 4-6 depending on how you serve the chicken salad. Storage: All 4 of these recipes will stay good refrigerated for up to 4 to 5 days. Disclaimer: This post is sponsored by YQ by Yoplait. I was compensated and all opinions are my own. 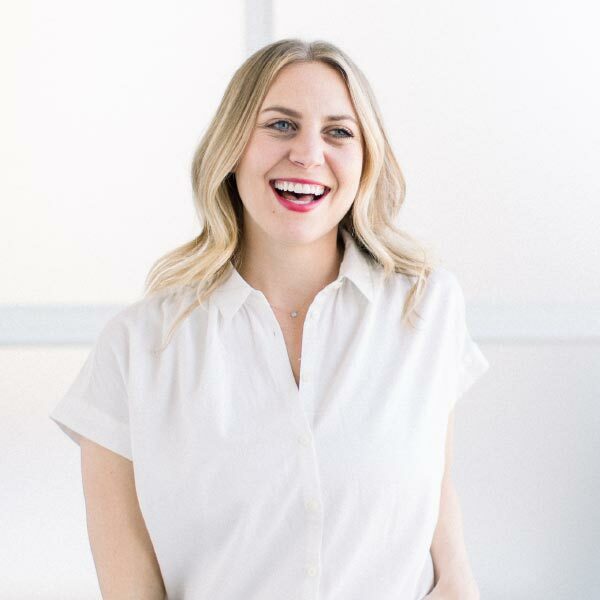 Thank you for supporting Fit Foodie Finds and making this website possible!